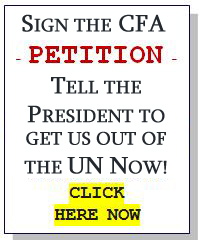 Help Council for America fight to protect American sovereignty. Council for America® and it's project Americans for Sovereignty® fight to maintain the sovereignty of the United States. American sovereignty allows the people of the United States to enjoy liberty and freedoms that no other people in the world have. The independence of the United Sates has been purchased and continues to be purchased with the blood of many brave Americans. It is our responsibility as American citizens to defend our nation’s sovereignty so future generations will also know the freedom that our forefathers have bequeathed to us. Your help is needed now. Please use this secure and verified online donation page to contribute to help the fight to protect American sovereignty. Thank you. Without the generous support of people like you, we would not be able to keep up our hard work. Thank you, again, for your support during these important times. * Contributions and gifts to Council for America are not deductible as charitable contributions for Federal income tax purposes.